As driverless cars—or more formally, autonomous vehicles—continue to attract growing interest and investment, the associated liability issues are also getting increased attention. Often, this attention comes in the form of suggestions that liability concerns will slow or even completely prevent consumer access to advanced autonomous vehicle technology. That would be a mistake. While liability will always be important with respect to motor vehicle operation, automation will dramatically increase safety on the highways by reducing both the number and severity of accidents. To some extent, it already has. For example, electronic stability control systems, which help drivers maintain control on turns and slippery surfaces by automatically selecting which wheels to use for braking, have saved thousands of lives.1 And, they have done so without confronting the courts with insurmountable questions regarding liability. Of course, emerging autonomous vehicle technologies are much more sophisticated than electronic stability control and can handle many more of the functions that today are performed by human drivers. Over the next decade, spurred by new state laws permitting the operation of autonomous vehicles and by continued investment in research and development, many more vehicle automation technologies will transition out of the laboratory and into widespread commercial use. This paper provides a discussion of how products liability law will impact autonomous vehicles, and provides a set of guiding principles for legislation that should—and that should not—be enacted. In some very specific, narrow respects, state-level legislative clarity regarding autonomous vehicle liability can be beneficial. Vehicle manufacturers that sell non-autonomous vehicles, for example, should not be liable for defects in third-party vehicle automation systems installed in the aftermarket. But broad new liability statutes aimed at protecting the manufacturers of autonomous vehicle technology are unnecessary. The legal precedents established over the last half a century2 of products liability litigation will provide manufacturers of autonomous vehicle technology with a very strong set of incentives to make their products as safe as possible. In the overwhelming majority of cases, they will succeed. However, despite these efforts, there will inevitably be some accidents attributable in whole or in part to defects in future vehicle automation systems. While this will raise complex new liability questions, there is no reason to expect that the legal system will be unable to resolve them. In short, the liability concerns raised by vehicle automation are legitimate and important. But they can be addressed without delaying consumer access to the many benefits that autonomous vehicles will provide. We take it for granted that this is a necessary price for the flexibility conferred by individual motor vehicle ownership. In the long run, this tradeoff will be viewed as a historical aberration, present only during the century or so when technology enabled the mass production of cars, but not of highly automated systems to help drive them safely and reliably. Of course, we should not forcibly strip drivers of the choice to do their own driving. But automation will provide an option to reduce or remove the burden of driving tasks that very few people enjoy, such as navigating crowded freeways and city streets during rush hour. 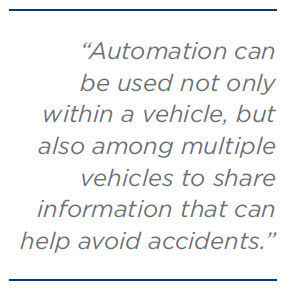 To a limited extent, vehicle automation has already provided important safety benefits. Features such as anti-lock braking have long been standard, and have helped to save many lives. Thus, the concept of allowing a computer to control a motor vehicle’s systems in the interest of safety is not new. What is new is the degree to which automated systems are becoming capable of taking over driving functions that, only a few years ago, were far too complex to entrust to a computer. The issue of liability invariably gets raised in policy discussions regarding autonomous vehicles. This is eminently sensible. When autonomous vehicles become involved in accidents, resolving the question of fault will indeed require considering novel and in some cases challenging questions. This paper, and the set of legislative guiding principles it provides, reflect a view that, subject to a few narrow exceptions, existing tort and contract law frameworks are generally very well equipped to address these questions. Thus, there is not a need to encumber the legal system with a new set of overly broad federal or state liability statutes relating to autonomous vehicles. Products liability law offers a time-tested framework that has proven to be adaptive to technology-driven liability issues in many other contexts. There is good reason to be optimistic that it will be equally capable of doing so when applied to autonomous vehicles. Vehicle automation spans a broad spectrum, and the technologies that have made it into commercial production represent only a small fraction of those under development. The next several years are likely to see increasing commercial availability of more advanced systems, including improved solutions for automatically keeping cars from drifting across lane lines. In 2013 the NHTSA released a classification system partitioning vehicle automation into five levels, ranging from level 0 (“no automation”) to level 4 (“full self-driving automation”).19 (The full definition provided by the NHTSA for each of these levels is included in this paper as Appendix A). The systems that automatically apply the brakes when they sense an impending frontal collision are in many respects quite sophisticated, yet they only correspond to NHTSA automation level 1 (“function-specific automation”). DARPA doubled the prize and ran the event again in 2005 on a 132-mile course. This time, five vehicles completed the course.23 The winning entry, from Stanford, did it in under seven hours. What had in 2004 been considered by some to be indication of the immaturity of autonomous vehicle technology turned, 18 months later, into a spectacular demonstration of how quickly the technology can advance. Today, research in vehicle automation is thriving, with major efforts at Google, most of the major auto manufacturers, government organizations, and many universities. In light of this level of attention and investment, vehicle automation is unsurprisingly experiencing unprecedented innovation. The most notable effort is Google’s self-driving car project. Google’s self-driving cars use a combination of lasers, radar, and cameras to gather information about other nearby objects, such as vehicles, cyclists, and pedestrians. This information is then combined with data from GPS, other on-board sensors (such as accelerometers), and digital map data to make navigation decisions. Google’s self-driving cars have traveled more than 500,000 miles without causing an accident while in self-driving mode. A video24 released by the company in 2012 shows a Google self-driving car ferrying its passengers around Silicon Valley, stopping at a drive-in window to allow the passengers to order food, and then taking them to the dry cleaners. The research advances over the past few years have proven that vehicle automation technologies can perform amazingly well. But they aren’t perfect, and they never will be. Sometimes autonomous vehicles will become involved in accidents due at least in part to a defect in the autonomous vehicle technology. In the inevitable lawsuits that follow, courts will look to products liability law to identify the appropriate remedies for any resulting injuries and property damage. 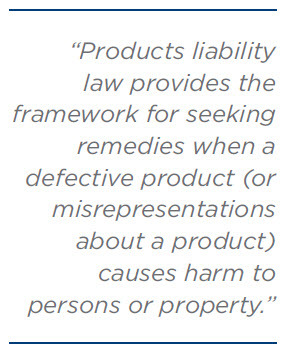 Products liability law26 provides the framework for seeking remedies when a defective product (or misrepresentations about a product) causes harm to persons or property. It is a complex and evolving mixture of tort law and contract law. Tort law addresses civil, as opposed to criminal, wrongs (i.e., “torts”) that cause injury or harm, and for which the victim can seek redress by filing a lawsuit seeking an award of damages. A common tort, both in products liability and more generally, is negligence. A plaintiff in a products liability lawsuit will typically cite multiple “theories” of liability in an attempt to maximize the odds of prevailing on at least one and thereby obtain a damages award (or a large settlement). The most commonly encountered theories of liability are negligence, strict liability, misrepresentation, and breach of warranty. Each of these is discussed below with examples showing how they might apply in the case of autonomous vehicles. Negligence: Product manufacturers have a duty to exercise a reasonable degree of care in designing their products so that those products will be safe when used in used in reasonably foreseeable ways. As a (very unlikely!) thought experiment, consider a manufacturer of fully automated (e.g., specifically designed so no driver intervention is needed) braking systems that, against all common sense, conducts testing using only vehicles driven on dry road surfaces. If the braking systems then prove unable to reliably avoid frontal collisions on wet roads, a person injured in a frontal collision on a rainy day could file a negligence claim. He or she could argue that his or her injuries were directly attributable to the manufacturer’s negligent failure to anticipate driving in wet conditions as a reasonably foreseeable use of a car equipped with the fully automated braking system. State courts vary in their interpretations of the scope of strict liability. The doctrine was originally articulated in a 1963 California Supreme Court ruling28 and then incorporated by the American Law Institute in the “Restatement (Second) of Torts”29 in 1965 (often referred to as the “Restatement (Second)”, or the “Second Restatement”). That in turn led to its near universal adoption in state courts in cases over the subsequent several decades. Under the Second Restatement—and thus under an enormous body of products liability case law—a manufacturer can be liable for the sale of a product containing an “unreasonably dangerous” defect even if it has “exercised all possible care in the preparation and sale” of the product. In addition, the liability can apply even if the user of the product “has not bought the product from or entered into any contractual relation with the seller.”30 As a result, any entity in the product distribution chain upstream from the user can be held strictly liable,31 and the user does not need to have purchased the product at all. If a manufacturing defect injures a passenger riding in a car owned by a friend, the injured passenger could file a strict liability claim against the manufacturer (or other entities in the distribution chain). In 1998, the American Law Institute published the “Restatement (Third) of Torts: Product Liability.”32 The Third Restatement specifically addresses each of manufacturing defects, design defects, and failure to warn, but, notably, ties liability for design defects and failure to warn to “foreseeable risks.” Under this framework, which will likely be used by an increasing number courts in the future, the failure of a manufacturer to identify and mitigate a dangerous “foreseeable” risk is more akin to negligence than to strict liability. While the landscape is somewhat in flux with respect to the specific theories of liability that can be invoked to pursue claims regarding manufacturing defects, design defects, and failure to warn, all three remain central to products liability law. Suppose that an autonomous vehicle manufacturer markets a vehicle that it claims has NHTSA level two automation. But what does “short notice” mean? Consider an accident that occurs because a human driver does not take over control of the autonomous vehicle quickly enough. In a products liability lawsuit, an injured party would likely argue that the autonomous vehicle had a design defect, because it should have been designed to provide the driver with more advanced warning. The manufacturer of the system might counter by arguing 1) that the system did provide sufficient advanced warning, and 2) that providing even more warning would necessitate adding very costly new sensors to the vehicle that would only increase the warning time so marginally as to make no practical difference in the time available to a driver to react. Liability for an alleged design defect is often determined using a risk-utility test,36 the standards of which vary in different states. Risk-utility tests generally examine whether the risks posed by an alleged design defect could have been avoided or reduced through the use of an alternative solution that would not have impaired the utility of the product or unnecessarily increased its cost. Failure to warn: Manufacturers that fail to provide adequate information regarding the risks of using a product can be liable for failure to warn when an injury attributable to this lack of information occurs.37 To minimize this exposure, manufacturers tend to err on the side of being very conservative n issuing such warnings. For example, Mercedes-Benz’s Distronic Plus, which uses automatic braking to help reduce the risk and severity of frontal collisions, is accompanied by a warning to “[a]lways pay attention to traffic conditions even when DISTRONIC PLUS is activated. Otherwise, you may fail to recognise dangers in time, cause an accident and injure yourself and others.”38 As manufacturers introduce new forms of vehicle automation, they will no doubt include copious warnings about the attendant risks. Post-sale safety with respect to autonomous vehicles will also involve software upgrades. Manufacturers that become aware of potentially risky software problems will need to act quickly to provide upgrades as soon as possible, but at the same time will need to ensure to appropriately test the upgraded software before releasing it. Properly finding that balance will in some cases be challenging, in part due to the associated liability considerations. There is also the question of how the upgrade installation will be managed. Configuring vehicles to accept automatic upgrades would be more efficient, but could also be viewed as problematic by owners who want to specifically approve any changes to their vehicle’s software. And, upgrades will also need to be handled in a manner minimizing any cybersecurity risks. example illustrates, misrepresentation involves the communication of false or misleading information. Liability for misrepresentation can occur when a person who reasonably relies on that information suffers harm (i.e., the misrepresentation is “tortious”). There are several subcategories of tortious misrepresentation.Fraudulent (also called intentional) misrepresentation occurs when a party knowingly provides false or misleading information that causes harm. Negligent representation occurs when the party providing the information knew or should have known that it was false. Strict liability for misrepresentation can be asserted without the need to show whether the defendant knew that the information was false. Misrepresentation does not always involve a product defect. In the example above, it is possible that the autonomous vehicle could have been intentionally designed to require human intervention every few minutes. The liability would then arise not from any manufacturing or design defect, but because misleading information about the vehicle’s capabilities was conveyed to the buyer. Breach of Warranty: Negligence, strict liability, and tortious misrepresentation are all features of tort law. In addition, products liability involves contract law due to the warranties created through the process of marketing and selling products. Warranties are assurances, either explicit or implicit, that goods being sold (or leased) are of sufficient quality. If that turns out not to be true, and if an injury to a purchaser of a product occurs as a result, then he or she may have grounds for a products liability claim based on breach of warranty. Product warranties and many other aspects of commercial transactions are addressed in the Uniform Commercial Code (UCC),41 which was originally published in 1952 by the National Conference of Commissioners on Uniform State Laws (now called the Uniform Law Commission)42 and the American Law Institute (ALI). It has been revised multiple times in the decades since its original publication to adapt to changes in the legal and broader commercial environment. The UCC is intended to help provide uniformity of law with respect to commercial transactions across multiple jurisdictions, and has been adopted, in some cases with modifications, by all of the states and the District of Columbia. With respect to product liability, the most relevant portions of the UCC are those addressing express and implied warranties. An express warranty is created through promises made by a seller to a prospective buyer in association with the sale of goods.43 In the context of vehicle automation, this could occur through the actual vehicle warranties provided to a buyer. It could also occur through advertising. If a provider of automated parallel parking systems advertises that its technology works just as well at night as during the day, but the system turns out to work well during the day but not at night, a purchaser could legitimately claim that the express warranty regarding the performance of the system has been breached. An express warranty can also be created through a description of goods provided pursuant to a sale. If the automated parallel parking technology provider describes its system in online marketing brochures as able to “parallel park in spaces only three feet longer than the vehicle,” but in fact sells a system that only works in spaces at least five feet longer than the vehicle, a buyer could claim breach of warranty. Finally, an express warranty can be created through a sample employed during the sale process. Consider a buyer purchases a new vehicle in part based on a demonstration of a manufacturer-installed automated parking system on a vehicle different from the one he or she eventually purchases. If the buyer then finds that the system included with his or her own vehicle doesn’t perform nearly as well as the demonstration model used in the sale, he or she would have a claim for breach of warranty. In addition, a seller of goods creates an implicit warranty that the goods will be fit for the purpose for which they are sold.47 An automated parallel parking system should in fact be capable of using automation to help a driver park a vehicle. If, instead, the system automatically rotates the steering wheel in a manner that would make it impossible to use without causing a collision, a purchaser of the vehicle could assert that the implied warranty accompanying the sale of the product had been breached. with an allegedly defective autonomous vehicle could make a manufacturing defect claim against the autonomous vehicle manufacturer, but would not generally have any basis for asserting liability claims based on misrepresentation, breach of warranty, or failure to warn. Liability insurance is an additional complicating factor. With respect to non-autonomous vehicles, the methods used by insurers to seek recovery from manufacturers vary in different states. Consider a driver (today, of a non-autonomous car) who gets in an accident attributable, he or she believes, to a manufacturing defect. If the driver is sued by someone injured in the accident, in some states the driver’s insurer will then have the driver “implead” (bring in as a party to the lawsuit) the manufacturer. In other states, the insurer will wait until the case concludes, pay out any resulting claims, and then initiate a separate action against the manufacturer. Autonomous vehicles will complicate the already complicated entanglements between insurance providers, plaintiffs, drivers/owners named as defendants, and manufacturers. One initial question is the extent to which insurance providers might incentivize the use of certain autonomous technologies, over and above those (such as vehicle-to-vehicle communications) that might be required through regulation. In addition, as a condition of providing insurance for drivers of autonomous vehicles, insurers may require greater access to data that could be used to reconstruct the actions that a driver of a vehicle—and/or the software partially controlling the vehicle—took in the moments preceding an accident. Finally, it should be noted that products liability is not the only form of liability that will arise in association with autonomous vehicle use. All but the most fully automated vehicles will be controlled, at least some of the time, by human drivers. Untangling fault for accidents will sometimes involve complex questions of liability shared by both the human driver and autonomous vehicle technology providers. Technology As Enabler; Liability As Impediment? Liability concerns have also figured prominently in state legislative initiatives related to autonomous vehicles. Autonomous vehicle legislation has been introduced in many states, and enacted in California,62 Florida,63 Michigan,64 Nevada,65 and the District of Columbia.66 The California and Nevada statutes are silent on liability. By contrast, the D.C., Florida, and Michigan statutes contain language protecting original manufacturers from liability for defects introduced on the aftermarket by a third party who converts the a nonautonomous vehicle into an autonomous vehicle. However, while that statement is certainly true with respect to legislation clarifying the legality of operating autonomous vehicles on public roads, it does not follow that all of the associated liability questions need to be addressed before the public can get access to new autonomous vehicle technologies. Subject to a few narrow exceptions, there are good reasons (see principles two and three below) to let the courts address such questions, when and as they arise. positive feedback cycle involving case law, the American Law Institute’s Second (in 1965) and Third (in 1998) Restatements, revisions to the Uniform Commercial Code, and changes to state statutory law. Through this process, products liability law has evolved to its current state. Given this strong record of adaptation to new technologies, there is no reason to expect that the legal system will be unable to address the products liability issues that arise with respect to autonomous vehicles. The authors of the 2014 RAND report also raised the possibility of (and recognized the drawbacks of) federal legislation that would “flatly limit liability”69 for autonomous vehicle technology. To put it mildly, congressional preemption of state tort remedies with respect to autonomous vehicle liability would be a mistake. Liability for vehicle manufacturing defects has always been the province of state courts applying state tort remedies. 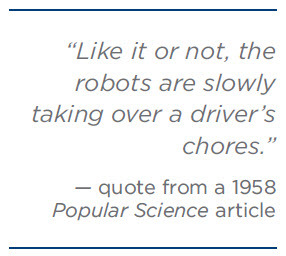 That should continue to be the case for autonomous vehicles. While it is certainly true that state court remedies are sometimes inconsistent, it does not follow that the solution is for the federal government to strip state courts of their authority. Among other problems, federal preemption would put the federal government in the impossible position of trying to formulate the “right” set of liability standards that would then be imposed, including the inevitable mistakes they would contain, on the states. 4. Manufacturers of non-autonomous vehicles should not be liable for alleged defects introduced through third party conversions into an autonomous vehicle. Common sense would hold that, if an original manufacturer in no way participates in or promotes the post-sale installation of autonomous vehicle technology manufactured by a third party, the original manufacturer should not be liable for alleged defects in that technology. Unfortunately, some of the case law relating to liability for third-party conversions in other contexts doesn’t necessarily support this common sense conclusion. In 1996, for example, an Illinois court wrote that “[w]here an unreasonably dangerous condition is caused by a modification to the product after it leaves the manufacturer’s control, the manufacturer is not liable unless the modification was reasonably foreseeable.”70 If applied in the context of autonomous vehicles, the logic of the “unless” clause could be problematic. After all, when autonomous vehicle technology becomes common, modifications to install it in non-autonomous vehicles will be “reasonably foreseeable.” Yet it would be unfair on that basis alone to saddle original manufacturers of non-autonomous vehicles with liabilities for third party autonomous vehicle technologies they had no role in creating or installing. Thus, this is an area in which state-level legislation to shield manufacturers from this unreasonable third-party liability is in fact beneficial. The District of Columbia, Florida, and Michigan autonomous vehicle statutes provide this projection, though the statutes in California and Nevada do not. 5. In the long term, federal attention to safety standards for autonomous vehicles will be needed, and those standards will have liability implications. As noted above, federal level legislation specifically preempting state authority regarding autonomous vehicle liability would be mistake, However, that does not mean there is no proper federal role related to autonomous vehicles more generally. In particular, just as the federal government has established “minimum safety performance requirements for motor vehicles” in the context of non-autonomous vehicles,71 the federal government has a clear role in setting safety standards for autonomous vehicles. In its May 2013 “Preliminary Statement of Policy Concerning Automated Vehicles,” NHTSA stated that it “is conducting research on self-driving vehicles so that the agency has the tools to establish standards for these vehicles, should the vehicles become commercially available.”72 This will clearly be a long process, and the lack of specific minimum safety standards shouldn’t be a reason to put the entire autonomous vehicle industry on hold. Even in the absence of such standards, the incentives for manufacturers to provide safe autonomous vehicle technologies are extremely high. However, as the autonomous vehicle industry matures in the coming years, it will be important to establish a nationally consistent set of safety regulations. Those standards, once they are established, would indirectly impact liability: The process of setting standards at the federal level would provide a set of metrics that state courts would likely choose to adopt in liability cases. Given this framework, it is sensible, and in fact advisable, for the Federal Motor Carrier Administration to proactively consider the best ways to regulate commercial motor vehicles in the different NHTSA automation levels, starting at levels two and 3. Not all of this regulation would directly involve liability. But the process of setting standards would also have clear ties to liability issues, as noted above in association with principle number 5. While there can clearly be differing views on how fast autonomous vehicle technologies will be adopted, there is really no dispute that, as IHS Automotive states, it is a matter of if and not when. The result will be a driving environment that, on average, is far safer than what we are accustomed to today. Accidents, however, will always be an aspect of motor vehicle travel, and the liability questions that autonomous vehicles will raise are thus important and worthy of attention. That should not, however, be a reason to prevent consumer access to autonomous vehicle technology. The United States has a robust products liability law framework that, while certainly not perfect, will be well equipped to address and adapt to the autonomous vehicle liability questions that arise in the coming years. The author thanks John W. Edwards II of Jones Day for valuable discussions and feedback on this paper. The driver is in complete and sole control of the primary vehicle controls (brake, steering, throttle, and motive power) at all times, and is solely responsible for monitoring the roadway and for safe operation of all vehicle controls. Vehicles that have certain driver support/convenience systems but do not have control authority over steering, braking, or throttle would still be considered “level 0” vehicles. Examples include systems that provide only warnings (e.g., forward collision warning, lane departure warning, blind spot monitoring) as well as systems providing automated secondary controls such as wipers, headlights, turn signals, hazard lights, etc. Although a vehicle with V2V warning technology alone would be at this level, that technology could significantly augment, and could be necessary to fully implement, many of the technologies described below, and is capable of providing warnings in several scenarios where sensors and cameras cannot (e.g., vehicles approaching each other at intersections). Automation at this level involves one or more specific control functions; if multiple functions are automated, they operate independently from each other. The driver has overall control, and is solely responsible for safe operation, but can choose to cede limited authority over a primary control (as in adaptive cruise control), the vehicle can automatically assume limited authority over a primary control (as in electronic stability control), or the automated system can provide added control to aid the driver in certain normal driving or crash-imminent situations (e.g., dynamic brake support in emergencies). The vehicle may have multiple capabilities combining individual driver support and crash avoidance technologies, but does not replace driver vigilance and does not assume driving responsibility from the driver. The vehicle’s automated system may assist or augment the driver in operating one of the primary controls – either steering or braking/throttle controls (but not both). As a result, there is no combination of vehicle control systems working in unison that enables the driver to be disengaged from physically operating the vehicle by having his or her hands off the steering wheel AND feet off the pedals at the same time. Examples of function specific automation systems include: cruise control, automatic braking, and lane keeping. safely. An example of combined functions enabling a Level two system is adaptive cruise control in combination with lane centering. The major distinction between level one and level two is that, at level two in the specific operating conditions for which the system is designed, an automated operating mode is enabled such that the driver is disengaged from physically operating the vehicle by having his or her hands off the steering wheel AND foot off pedal at the same time. Vehicles at this level of automation enable the driver to cede full control of all safety-critical functions under certain traffic or environmental conditions and in those conditions to rely heavily on the vehicle to monitor for changes in those conditions requiring transition back to driver control. The driver is expected to be available for occasional control, but with sufficiently comfortable transition time. The vehicle is designed to ensure safe operation during the automated driving mode. An example would be an automated or self-driving car that can determine when the system is no longer able to support automation, such as from an oncoming construction area, and then signals to the driver to reengage in the driving task, providing the driver with an appropriate amount of transition time to safely regain manual control. The major distinction between level two and level three is that at level 3, the vehicle is designed so that the driver is not expected to constantly monitor the roadway while driving. The vehicle is designed to perform all safety-critical driving functions and monitor roadway conditions for an entire trip. Such a design anticipates that the driver will provide destination or navigation input, but is not expected to be available for control at any time during the trip. This includes both occupied and unoccupied vehicles. By design, safe operation rests solely on the automated vehicle system. National Center for Statistics & Analysis (NCSA), National Highway Traffic Safety Administration (NHTSA), Traffic Safety Facts: Estimating Lives Saved by Electronic Stability Control, 2008-2010, Report No. DOT HS 811 634 (Washington, DC, Nov. 2012) [hereinafter Estimating Lives Saved by Electronic Stability Control], available at http://www-nrd.nhtsa.dot.gov/Pubs/811634.pdf . The Research Note provides figures of 634 lives saved in 2008, 705 in 2009, and 863 in 2010, for a total of 2202. Id. at 1. Products liability law has a history that goes back hundreds or even thousands of years. However, the 1960s, which saw the publication of the Restatement (Second) of Torts §402A (1965) by the American Law Institute can be considered a key decade in laying the groundwork for modern products liability law. NHTSA, 2012 Motor Vehicle Crashes: Overview, Report No. DOT HS 811 856 (Washington, DC, November 2013), available at http://www-nrd.nhtsa.dot.gov/Pubs/811856.pdf. Drunk driving accounted for about one third of the 2012 traffic fatilities. See “Drunk Driving Deaths Increased in 2012,” MADD, November 14, 2013, http://www.madd.org/blog/2013/november/2012-fatality-data.html. Other common causes of accidents, including fatal accidents, include speeding and driver distraction. Press Release, NHTSA, U.S. Department of Transportation Release Policy on Automated Vehicle Development (May 30, 2013) [hereinafter NHTSA May 30 Press Release], available at http://www.nhtsa.gov/About+NHTSA/Press+Releases/U.S.+Department+of+Transportation+Releases+Policy+on+Automated+Vehicle+Development. See also the accompanying more detailed Press Release, NHTSA, Preliminary Statement of Policy Concerning Automated Vehicles (May 30, 2013) [hereinafter NHTSA Preliminary Statement], available at http://www.nhtsa.gov/staticfiles/rulemaking/pdf/Automated_Vehicles_Policy.pdf released simultaneously with this press release. 1958 Chrysler Auto-Pilot Brochure, Oldcarbrochures.com, available at http://www.oldcarbrochures.com/static/NA/Chrysler_and_Imperial/1958_Chrysler/1958_Chrysler_Auto-Pilot_Brochure/1958%20Chrysler%20Auto-Pilot%20Brochure-01.html (last visited April 1, 2014). Frank Rowsome Jr. 1958 Imperial: What It’s Like To Drive An Auto-Pilot Car, Popular Science (Apr. 1958), reprint available at http://www.imperialclub.com/~imperialclub/Articles/58AutoPilot/index.htm (last visited April 1, 2014). 1970 Lincoln Continental and Continental Mark III Brochure, Oldcarbrochures.com, at 15, available at http://www.oldcarbrochures.com/static/NA/Lincoln/1970_Lincoln/1970%20Lincoln%20Continental%20Brochure/1970%20Lincoln%20Continental-01.html (last visited April 1, 2014). On paved roads, antilock braking systems (ABS) generally allow for shorter stopping distances and increased driver steering control. However, on gravel surfaces, ABS can actually lead to increased stopping distances. See David Burton, Amanda Delaney, Stuart Newstead, David Logan, Brian Fildes, Evaluation of Anti-lock Braking Systems Effectiveness, Royal Automobile Club of Victoria, Research Report 04/01 (Apr. 2004), available at http://www.monash.edu.au/miri/research/reports/other/racv-abs-braking-system-effectiveness.pdf (last visited April 1, 2014). More specifically, the mandate applies to new light vehicles manufactured on or after September 1, 2012. See Press Release, NHTSA, New NHTSA Report Shows Federal ESC Requirement Saving Lives (Nov. 30, 2012), http://www.nhtsa.gov/About+NHTSA/Press+Releases/2012/New+NHTSA+Report+Shows+Federal+ESC+Requirement+Saving+Lives. Estimating Lives Saved by Electronic Stability Control, supra note 1. The Research Note provides figures of 634 lives saved in 2008, 705 in 2009, and 863 in 2010, for a total of 2202. Volvo’s City Safety is aimed primarily at slower driving, which is more likely to be encountered in congested areas. Thus, it is configured to be active only when the vehicle speed is below a speed threshold. See Highway Loss Data Institute (HLDI), Volvo City Safety loss experience – an update, Bulletin Vol. 29, No. 23, at 1, Arlington, VA. (Dec. 2012), available at http://www.iihs.org/media/48c6e9ae-d60b-4cc7-9bf6-a330ef1d177e/-808307776/HLDI%20Research/Bulletins/hldi_bulletin_29.23.pdf (last visited April 1, 2014). This and other HLDI studies are available at Crash avoidance technologies, Insurance Institute for Highway Safety (IIHS), http://www.iihs.org/iihs/topics/t/crash-avoidance-technologies/hldi-research (last visited April 1, 2014). The HLDI is an insurance industry-supported organization that performs “scientific studies of insurance data representing the human and economic losses.” See About the Institutes, IIHS, http://www.iihs.org/iihs/about-us/member-groups (last visited April 1, 2014). Safety, Mercedes-Benz USA, http://www.mbusa.com/mercedes/benz/safety#module-2 (last visited April 1, 2014). HLDI, Mercedes-Benz collision avoidance features: initial results, Bulletin Vol. 29, No. 7, at 7, Arlington, VA. (Apr. 2012), available at http://www.iihs.org/media/e368e3e5-ff90-4db7-86d1-e7daecc4afc8/-1481340172/HLDI%20Research/Collisions%20avoidance%20features/29.7-Mercedes.pdf (last visited April 1, 2014). The specifics of how Distronic Plus operates depends in part on the speed of the vehicle. See id. at p. 1. James R. Healey, Kelsey Mays, Which cars park themselves best? Challenge results, USA Today (Dec. 6, 2012), http://www.usatoday.com/story/money/cars/2012/12/06/self-parking-cars-challenge/1743199/. NHTSA May 30 Press Release, supra note 5. See also the accompanying more detailed NHTSA Preliminary Statement, supra note 5, released simultaneously with this press release. Burkhard Bilger, Auto Correct – Has the self-driving car at last arrived?, The New Yorker (Nov. 25, 2013), http://www.newyorker.com/reporting/2013/11/25/131125fa_fact_bilger. Joseph Hooper, From Darpa Grand Challenge 2004DARPA’s Debacle in the Desert, Popular Science (June 4, 2004), http://www.popsci.com/scitech/article/2004-06/darpa-grand-challenge-2004darpas-debacle-desert. Mike Hanlon, Darpa Grand Challenge 2004 autonomous ground vehicle competition, gizmag (Mar. 12, 2004), http://www.gizmag.com/go/4128/. The Darpa Grand Challenge 2005, DARPA, http://archive.darpa.mil/grandchallenge05/gcorg/index.html (last visited April 1, 2014). Google, Self-Driving Car Test: Steve Mahan, YouTube (Mar. 28, 2013), http://www.youtube.com/watch?v=cdgQpa1pUUE (last visited April 1, 2014). Press Release, NHTSA, U.S. Department of Transportation Announces Decision to Move Forward with Vehicle-toVehicle Communication Technology for Light Vehiclest (February 3, 2014), available at http://www.nhtsa.gov/About+NHTSA/Press+Releases/2014/USDOT+to+Move+Forward+with+Vehicle-to-Vehicle+Communication+Technology+for+Light+Vehicles. Parentheses in original. For a detailed treatment of products liability law, see, e.g., David G. Owen, Products Liability Law, Hornbook (St. Paul, Minn., Thomson/West 2005). The ability to recover damages from a manufacturer for breach of warranty can depend, in part, on whether the purchaser bought the product directly from a manufacturer or through an intermediary. The ability of “remote purchasers” to recover breach of warranty damages from a manufacturer varies among states. Greenman v. Yuba Power Products, Inc., 59 Cal. 2d 57 (1963). Restatement (Second) of Torts §402A (1965). Id. Section 402A also provides that the liability applies if “the seller is engaged in the business of selling such a product.” Thus, a private individual who sells a used car would not be liable under 402A for a manufacturing defect it might contain. While any entity in the distribution chain could be implicated when a retailer is sued in a strict liability claim, the retailer will typically then “implead” the manufacturer. Restatement (Third) of Torts (1998). The “all possible care” language is present in both the Restatement (Second) of Torts and the Restatement (Third) of Torts. The Restatement (Second) of Torts provides that “One who sells any product in a defective condition unreasonably dangerous to the user or consumer or to his property is subject to liability for physical harm thereby caused to the ultimate user or consumer, or to his property,” and that this liability applies although “the seller has exercised all possible care in the preparation and sale of his product.” Restatement (Second) of Torts §§ 402A(1), (2)(a) (1965). The Restatement (Third) of Torts provides that a product “contains a manufacturing defect when the product departs from its intended design even though all possible care was exercised in the preparation and marketing of the product.” Restatement (Third) of Torts: Product Liability § 2(a) (1998). Design defects are covered in the Restatement (Second) of Torts through the language providing liability for selling a product that is “unreasonably dangerous to the user or consumer”. Restatement (Second) of Torts § 402A(1) (1965). Design defects are explicitly addressed in the Restatement (Third) of Torts: A product “is defective in design when the foreseeable risks of harm posed by the product could have been reduced or avoided by the adoption of a reasonable alternative design by the seller or other distributor, or a predecessor in the commercial chain of distribution, and the omission of the alternative design renders the product not reasonably safe.” Restatement (Third) of Torts § 2(b) (1998). NHTSA Preliminary Statement, supra note 5, at 5. John W. Wade, On the Nature of Strict Tort Liability for Products, 44 Miss. L.J. 825 (1973). See Interactive Owner’s Manual: E-Class, Mercedes-Benz, http://www4.mercedes-benz.com/manual-cars/ba/cars/w212/en/manual_base.shtml (last visited April 1, 2014) (information can be found in subsection “Important Safety Notes” under Keyword “Distronic Plus”). See Restatement (Third) of Torts § 10 (1998), addressing “Liability of Commercial Product Seller or Distributor for Harm Caused by Post-Sale Failure to Warn.” According to Stilwell, who wrote in a 2007 article that “Since the publishing of the Third Restatement more than thirty states have adopted various versions of duties arising after the sale of a product.” Tom Stillwell, Warning: You May Possess Continuing Duties after the Sale of Your Product? (an Evaluation of the Restatement (Third) of Torts: Products Liability’s Treatment of Post-Sale Duties, The Review of Litigation, Vol. 27, No. 4, (Sept. 1, 2007), reprint available at http://www.questia.com/library/journal/1P3-1369721811/warning-you-may-possess-continuing-duties-after-the (last visited April 1, 2014). Recalls & Defects, NHTSA, http://www.nhtsa.gov/Vehicle+Safety/Recalls+&+Defects (last visited April 1, 2014). Publications Catalog, The American Law Institute, http://www.ali.org/index.cfm?fuseaction=publications.ppage&node_id=86 (last visited April 1, 2014). The Uniform Law Commission (ULC) was formerly known as the National Conference of Commissioners on Uniform State Laws. See Frequently Asked Questions, ULC, http://uniformlaws.org/Narrative.aspx?title=Frequently%20Asked%20Questions (last visited April 1, 2014). The three categories of express warranties are provided, respectively, in the Uniform Commercial Code (U.C.C.) §§2-313(1)(a), (b) and (c). Even in the absence of an exclusion, the implied warranty of merchantability only applies to goods sold by “a merchant with respect to goods of that kind.” See U.C.C. § 2-314(1). 45 U.C.C. § 2-314(2). Merchantable Definition, Law.com, http://dictionary.law.com/Default.aspx?typed=merchantable&type=1 (last visited Feb. 2, 2014). Ryan Calo, Open Robotics, 70 Md. L. Rev. 571-613 (2013), available at http://papers.ssrn.com/sol3/papers.cfm?abstract_id=1706293. Kyle Colonna, Autonomous Cars and Tort Liability, Case W. Res. J. L., Tech. & Internet (2012), Vol. 4, No. 3, at 81 (Fall 2013), available at http://papers.ssrn.com/sol3/papers.cfm?abstract_id=2325879. Sophia Duffy, Jamie P. Hopkins, Sit, Stay, Drive: The Future of Autonomous Car Liability, 16 SMU Sci. & Tech. Law Rev. 101 (Winter 2013), available at http://papers.ssrn.com/sol3/papers.cfm?abstract_id=2379697. Andrew P. Garza, “Look Ma, No Hands!”: Wrinkles and Wrecks in the Age of Autonomous Vehicles, 46 New Eng. L. Rev. 581 (2012), available at http://newenglrev.com/volume-46-issue-3/v46b3garza/. Kyle Graham, Of Frightened Horses and Autonomous Vehicles: Tort Law and its Assimilation of Innovations, 52 Santa Clara L. Rev. 1241 (2012), available at http://digitalcommons.law.scu.edu/lawreview/vol52/iss4/4/. Gary E. Marchant & Rachel A. Lindor, The Coming Collision Between Autonomous Vehicles and the Liability System, 52 Santa Clara L. Rev. 1321 (2012), available at http://digitalcommons.law.scu.edu/lawreview/vol52/iss4/6/. Bryant Walker Smith, Proximity-Driven Liability, 102 Geo. L. J. (forthcoming), available at http://papers.ssrn.com/sol3/papers.cfm?abstract_id=2336234. See also Bryant Walker Smith, Uncertain Liability, Stanford Law School (May27, 2013), http://cyberlaw.stanford.edu/blog/2013/05/uncertain-liability. Nidhi Kalra, James M. Anderson, Martin Wachs, Rand Corp., Liability and Regulation of Autonomous Vehicle Technologies (Apr. 2009), available at http://www.rand.org/pubs/external_publications/EP20090427.html. James M. Anderson, Nidhi Kalra, Karlyn D. Stanley, Paul Sorensen, Constantine Samaras, Oluwatobi Oluwatola, Rand Corp., Autonomous Vehicle Technology: A Guide for Policymakers (2014), available at http://www.rand.org/pubs/research_reports/RR443-1.html. Chris Nichols, Liability could be roadblock for driverless cars, The San Diego Union-Tribune (Oct. 30, 2013), http://www.utsandiego.com/news/2013/Oct/30/liability-driverless-car-transovation-google/. Douglas Newcomb, Will lawsuits kill the autonomous car?, MSN.com (Apr. 15, 2013), http://editorial.autos.msn.com/blogs/autosblogpost.aspx?post=577eb20f-399d-4124-a245-2a42b032f94c. Dan Strumpf, Liability Issues Create Potholes on the Road to Driverless Cars (Jan. 27, 2013), http://online.wsj.com/news/articles/SB10001424127887323854904578264162749109462. See Smith, supra note 54, at 1. See Marchant & Lindor, supra note 53, at 1139 (emphasis in original). Cal. Veh. Code § 38750. Melissa Anders, Autonomous vehicle testing now allowed under Michigan law, MLive, December 27, 2013, http://www.mlive.com/politics/index.ssf/2013/12/autonomous_vehicle_testing_now.html. Nev. Rev. Stat. § 482A. Autonomous Vehicles, Navigant Research (Aug. 18, 2013), http://www.navigantresearch.com/research/autonomous-vehicles. Kalra et al., supra note 55, at 47. Anderson et al., supra note 56, at 131 & 142. Davis v. Pak-Mor Mfg. Co., 672 N.E.2d 771, 775 (Ill. App. Ct. 1996) (citing Woods v. Graham Eng’g Corp., 539 N.E.2d 316, 318 (Ill. App. Ct. 1989)). NHTSA May 30 Press Release, supra note 4. Our Mission, U.S. Dep’t of Transp. : Federal Motor Carrier Safety Administration (FMCSA), http://www.fmcsa.dot.gov/mission (last visited Feb. 2, 2014). Press Release, IHS, Self-Driving Cars Moving into the Industry’s Driver’s Seat (Jan. 2, 2014), http://press.ihs.com/press-release/automotive/self-driving-cars-moving-industrys-drivers-seat. See NHTSA May 30 Press Release, supra note 5.